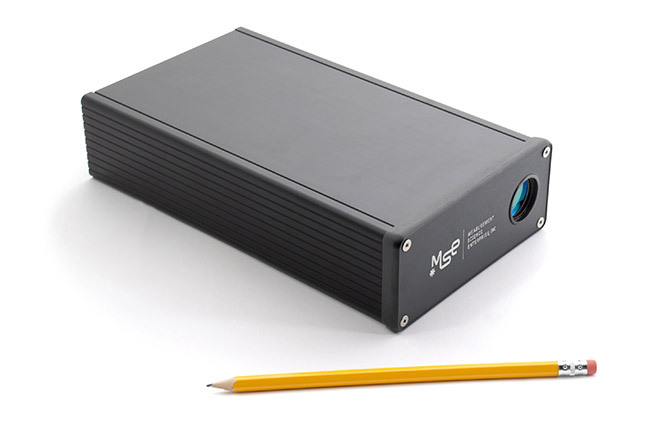 The Integrated miniLDV is the miniLDV probe featuring an all-inclusive probe body, proprietary hardware processor (Processing Engine) with USB interface, laser, and receiving optics and electronics. The complete system is about the size of a textbook. The integrated packaging is ideal for customers that prefer to minimize cabling between the sensor and the acquisition computer. With the Integrated miniLDV, only power and USB need to be connected to the probe housing. Because the optics are identical to that of the miniLDV, all the standard measurement distances are also available in the Integrated miniLDV. 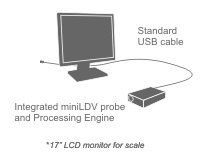 The Integrated miniLDV System consists of the Integrated miniLDV probe with integrated Processing Engine and the 1D Burst Processor Acquisition Manager software package. Optionally available are linear traversing systems (one or two axes) with manual or electronic drive (electronic traverses are controlled from within the software) and a computer with the software installed and verified by MSE technicians. All the optics, electronics, and processing is incorporated into a single housing. The probe simply connects to a host computer via a USB 2.0 interface. If the standard probes do not suit your needs, feel free to contact us and inquire about custom solutions.